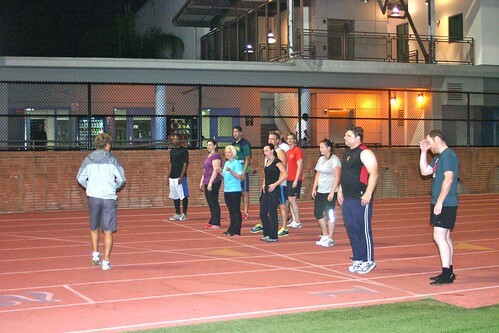 Track Night at Santa Monica College, tonight at 6:30! When people first start to crossfit they tend to see it as a world of almost impossible expectations and standards. However, they discover quite quickly that if they want to be able to do some of the amazing things we all witness all the time, then a few lifestyle changes can make it happen. It does not take long before people are inspired to start setting goals. This is where the self talk becomes important. The time spent in the box is only supplemental to all that encompasses a person’s lifestyle, and though members and coaches can influence an individual, it is the individual who sits in the drivers seat for the action plan toward their goal. Your action plan for increased strength, increased gymnastic skills, endurance, weight loss or whatever else even outside the box it may be could include several drills, dietary guidelines or other commitments. What is the voice that takes you through the commitments you make for yourself in the box and everyday life? Nobody enjoys negative feedback, especially if it is chronic. I believe the mind is smart though and will turn to its defense mechanisms in order not to face the discomfort of a disapproving voice. When you start using defense mechanisms against yourself you are just diverting your efforts from the intended goal and wasting them on an unnecessary battle. The dialog becomes a downward spiraling and reinforcing battle including stress and ill behavior. Examples include yoyo dieters or workaholics that complain about having no free time, yet fear what free time would mean in terms of productivity and thus never allow themselves free time. In both cases there is a goal, there is an intended action, there is a fear, there is a contradictory reaction, and somewhere amongst all that there is an internal dialog. The reason I bring this up is because i have noticed within myself and others in the gym, how the anticipation of negative self feedback creates unnecessary barriers in achieving optimal goals in the box. In my case, I used to get really nervous before all of my workouts, because I perceived the outcome as really meaningful. Inevitably having blown the WOD up in my mind to this huge big deal, the pressure to perform well became overwhelming. To hide from my own anxiety, I reach for the first possible excuse to downplay the wod I am about to perform… so far so good. I have some constructive mechanisms going on. However, the way in which I do this is largely through committing my mind to the idea that I will do another WOD throughout the day. And if it is the second, then it doesn’t matter if I don’t push myself, becasue I have already done a wod. That being said, I give myself permission to not be mentally committed and focussed on the WOD I am doing. I allow myself to have a poor outcome for fear of what it would mean for me to only do so-so in a wod to which I am fully committed. This is an unfortunate paradigm, for as I become less committed and focused, I perform less well and thus reinforce the fear of a less than optimal performance being an example of all that I can achieve. I came to think about my negative feedback when I walked away from Ventura Clash at 4th place and was hugely disappointed. I was so proud of how everyone else did, and yet could not really accept that 4th was an achievement. Then I thought about frogman, how I came 2nd and was not satisfied at all, because I believed if I had been more committed, I would have been first. Thinking about these salient events I came to realize just how chronic my disappointment in myself can be, and how as a reaction I find myself less and less mentally committed to the WOD. For UTC I had the excuse that I was just coming off an injury, for frogman I had just finished running a marathon. So I have come to think about what would it mean for me to really commit to something whole heartedly and prepare for it with the intention of bringing all that i can bring, and not just do it merely in the condition I find myself in with my bag of excises to not be fully focused. I am inhibiting my own performance in order to escape from my loaded perception of my achievements. it is easy to lose sight of your achievements when you get stuck obsessing about your inabilities.With this being said I cannot emphasize enough how useful it is to keep a diary of your crossfit wods, so that over time you can see your progress. There will be times where you cannot PR for a month or two and you will get frustrated. This will help you feel comfort in how far you have come and keep you proud of your progress. And as I review my goals, I am altering my action plan. Instead of just practicing snatches, handstand pushups and muscle-ups like no other, I will focus on being present in my wod, giving it all I have got and most importantly accepting at the end that what i achieved is really where I am at that time, that day… no more excuses. Allowing myself to really be in the moment and achieve intensity will no doubt help me improve across the board in crossfit, as the strength and skills we learn are transferable. My own negative feedback will no longer be what inhibits my performance. The intense environment of a wod is a great arena to observe your own self-talk, because you need yourself to get through it. Think about how you perceive yourself and your accomplishments, and whether you are potentially creating barriers towards your goals.